VoiceMap is a publishing platform for location-aware audio tours. Creating your own audio walk, cycle, riverboat cruise, drive or even rocketship ride is free, and our tools come bundled with the support, enthusiasm and expertise of our editors. VoiceMap was founded by storytellers, and we’ve used our experience to simplify the process of making a tour. In three steps — map, write, record — you can publish and sell your own VoiceMap. It’ll be available here, at voicemap.me, and from our iOS and Android audio tour apps. Our storytelling tutorial guides you through the process of mapping your tour, writing your script and recording the audio. Or, for an overview of the process, take a look at this infographic. We assign an editor to every project, to help you make the most of this new technology. They’ll help you get to grips with the tool and make sure that your audience looks left and turns right exactly when you want them to. Our editors are also all storytellers who have published with VoiceMap themselves, and they can help with other things too. You’ll have as much or as little help as you need. You’ll have access to live sales reports for your published tours, with estimated royalties. Payments are made via Paypal when royalties are equal to or greater than USD100 at the end of the month. You can also create promotional links to give your walks to the press or just friends and family for free, and you can bundle all of your routes and sell them as a single package with affiliate links, using your own website or social media accounts. Imagine knowing exactly where somebody is when they listen to your story. This is what makes audio with GPS autoplay such an exciting new medium. You can use VoiceMap’s publishing tool to immerse listeners in any kind of story, from traditional walking tours to documentaries to fictional audio dramas. VoiceMap’s storytellers are journalists, travel writers, filmmakers, bloggers, podcasters, tour guides, graffiti artists, playwrights, expats, and passionate locals. Some are expert guides who can quickly match a story to a map. Others are audio pros. Most are neither, and simply have a good story to tell. We like to emphasise personal perspectives, with phrases like “I remember” and “I hope”, and anybody, anywhere can create a VoiceMap tour. 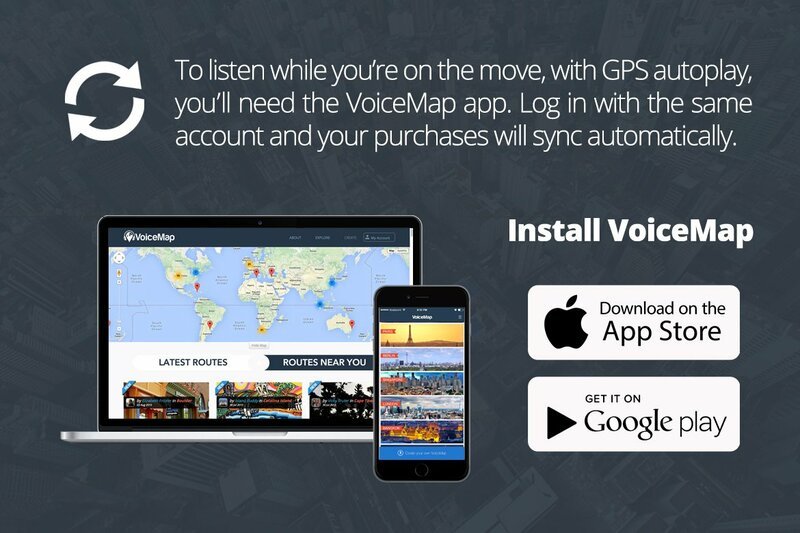 Once you publish your tour, it is available for purchase here, at voicemap.me, and through our Android and iPhone apps. You retain the copyright and choose the price of your tour. We pay royalties of 50% when your tour is sold. For more information, take a look at our publishing agreement. Already have an account? | Sign-up as a normal user?